We are all over PC gaming this week, but what do we know about PC gaming? Each day, one Kotaku editor will reveal their PC gaming knowledge (Uh-oh!) and share some memories. First up is me, your deputy editor. Sure. But if a game is also on consoles, I play that version. I've got a gaming laptop that's good enough to run StarCraft II, though had some fog issues with Civ V. Oh, and I get annoyed at PC gaming technicalities sometimes. Most of my PC gaming involves indie games, a lot of which come through in the winter when I play lots of Independent Games Festival nominees. I've come to associate PC gaming with playing small, quirky experiments less so than blockbusters. To: Ashcraft From: Totilo Re: TWO WEEKS, I HAVE MADE IT!! 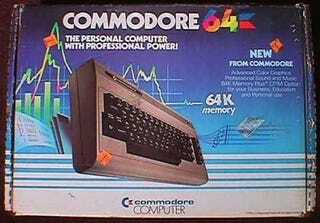 It had to be something on the Commodore 64 in the early 1980s. I still recall being annoyed that we were getting a computer. I recall telling my mother it seemed like cheating. I guess the calculator and typewriter lobby had me in their saw. My first game was… maybe Snooper Troops? It was an educational game, mostly in black in white, that had me and my brother looking for clues and driving through a town in a Ghostbusters-looking hearse or station wagon or something. After that I was in love with Accolade games, especially Accolade's Comics and The Train, which I think had me riding a locomotive while fighting Nazis. But I lost the disk. That still bugs me. I most loved Labyrinth, the Commodore 64 game based on the 1980s movie, when it went from text adventure to graphical adventure at an early moment in the plot. Blew my mind. Runners-up include the last few winters when I'm playing the likes of Braid or Miegakure months — years — before they come out. Realizing within seconds of turning the game on that I erred when I pointed to the two game boxes my mom was holding in the store and chose Sim City Gold (or was it Sim City Enhanced?) over Sim City 2000. Old game with CD-Rom bells and whistles vs. vastly better sequel. I chose the former? Karateka! Jordan Mechner's Prince of Persia has been so great in the last decade, can we get the bird-kicking karate game back too? I'll even play it on a computer. I promise.